Summer for NBA players can consist of many different directions and activities, for instance some players might go tripping and some players will find other basketball ventures to explore so that they can continue to up their game. The Drew League is a famous summer ball spot that was created in Los Angeles, and where numbers and numbers of NBA players and other high end ballers show their skill and work on their game. It’s one of many summer basketball hookups around the United States, following events like the Jamal Crawford named Crawsover League that helps fill the void of basketball that left when the Sonics moved to OKC. Other Leagues like the Goodman League based in Washington D.C follow suit with the aforementioned Crawsover and Drew League, but the Drew is the most popular and where fans can see how well their guys have developed, and see what kind of new additions they made to their game. 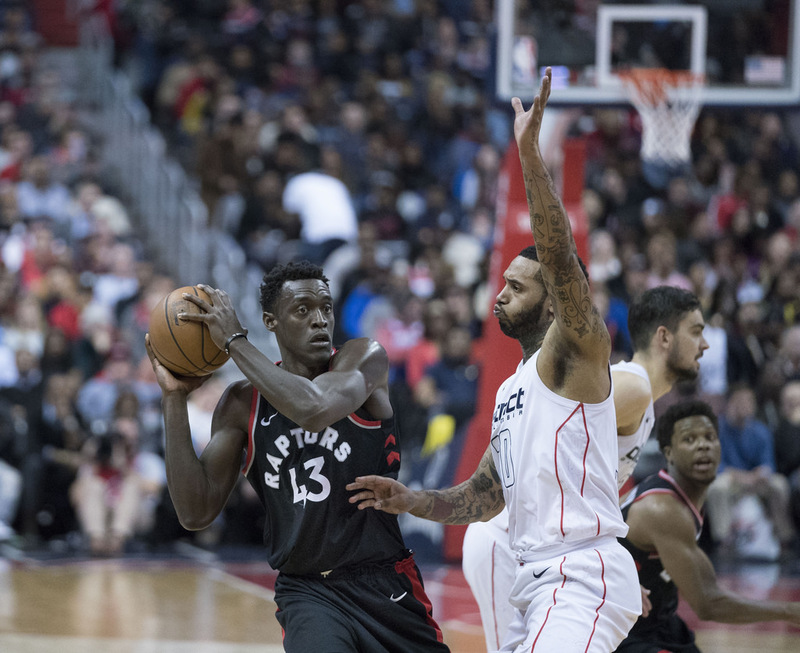 For Raptors energetic running wild forward Pascal Siakim, it was a chance to grow his game and a chance for eyes to see how good this kid can be. The Raptors had a wealth of bench players that you could pick out and say that they impressed you; Delon Wright Fred Fan Vleet, the former Raptor Jakob Pertl, and Pascal Siakim to name a few. They all brought something unique to the table and that’s what gave the Raptors the most depth they have had in years, and maybe ever. Delon brought his length for a guard size and awesome defensive ability, Fred brought his calmness while really showing leadership in a tough backup guard role, Pertl brought toughness and some solid rebounding before being shipped to San Antonio. But Pascal brought a little bit of everything and really grew onto his own in only his second season as an NBA player. He can drive off the bounce, is a big threat off the pick and roll, can pass it in tight spaces in the paint that somehow don’t get intercepted, and while not a big threat from deep he can be dependent to knock down a three or two when open. So when the Drew League came around in the summer and all the NBA talent when to LA to compete, it was a chance for Pascal to show his skills in every aspect of the game. Pascal dominated the Drew League against counterparts and former teammate Demar Derozan, posting a nasty 38-15-11 line while showing improvements in his ball handling and ho[hopefully improving a growing three point game. The Drew League is maybe the closest you can get to guys showing true competition in the summer, and while not true NBA level of games it still is a noticeable feat and what he has in store this coming season should keep fans happy and excited. With the addition of guys like Kawhi Leonard and Danny Green the Raptors defense is possibly the best it’s ever been, and it will allow Pascal to dominate more defensively like he has last year with the addition of more length in Kawhi and a more sound defender in Danny Green. Pascal dominates offensively better coming off a block, a solid contest of a shot, or a big rebound where he can push the break. When Nick Nurse throws out a lineup like Lowry-Delon-OG-Kawhi-Siakim on to the floor late in games to counter teams better offenses, it could make into some amazing defensive length plays from the Raptors, strips on balls in tight spots or even a little ball-hawking activity from the guard can push the offensive pace, where Siakim will benefit most either as a off ball runner or a man that can push the pace with the ball. Comparing players can be a dangerous and unfair play on players as it lessens players own talents, and doesn’t allow them to grow their own way. But Pascal Siakim reminds me of Draymond Green in how he plays, a more quiet way of doing pretty much everything while being a force on defense. Draymond is a one in a million player so Siakim has a tough go on being exactly like him, but if he can ball in the League like he did in the summer Drew League, the eyes will be on Siakim more and more like they were in this past summer.